Riquewihr is a medieval town right in the heart of the Alsatian vineyards, classified among the "Most Beautiful Villages in France". The town has prospered over the centuries, especially during the 16th century, thanks to its vineyards and to its wine trade for which it was famous throughout Europe. 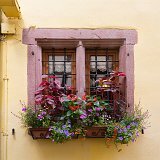 The fortified town of Riquewihr is protected by twin walls, The old town retains a very dense urban fabric: houses erected in the 15th to the 18th centuries provide an exceptional wealth of architecture. The town spread beyond the ramparts during the second half of the 19th century.